It wasn't long ago that I came across Planner5D which surprised me given that they claim to have over 3 million users at time of writing. So I thought I'd better review it. So here it is - my Planner 5D review. This review is one of several in the free floor plan software reviews series. I always like to know why something is free. Money has to be made somewhere right? At Planner 5D they make money by offering symbol packs so that you can make your designs as realistic as possible. This is a different type of business model than I've seen with other free floor plan software applications. Most companies make money by offering manufacturers the opportunity to have their products available as symbols on a platform, or by offering extra features to users in a paid version. Just out of interest I think Planner 5D comes from Russia originally - again something a little bit different. Getting started is easy. It's just a question of setting up an account or signing in through a social platform. It's an online application and there's an ipad version as well. We'll have to wait and see if they get an android version out. You can start from scratch or open a project that you're already working on. I started from scratch. Making the rooms are pretty straight forward. The process starts by selecting from various sizes and shapes of rooms, rather than constructing rooms out of walls. 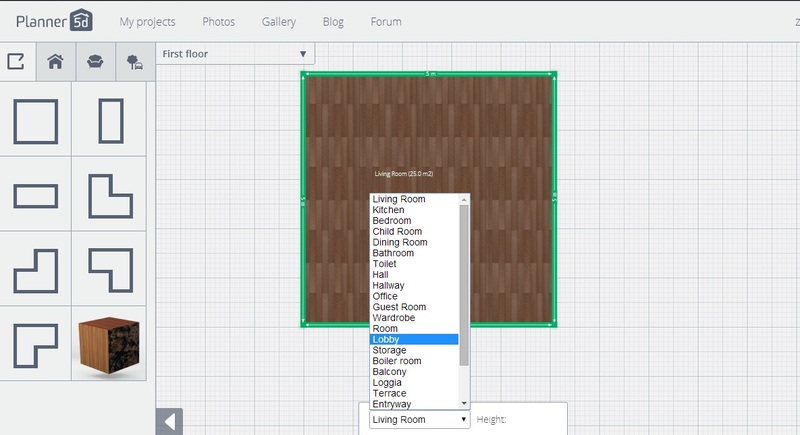 Once you select the shape of room you want, you can customize it according to your needs. You can delete a wall, drag the walls to increase the size, and you can add more points on the wall that can act like corners. More on what that weird looking cube at the bottom is later - keep reading! You can enter the dimensions at the bottom of the screen which is great because sometimes it's hard to get exactly the dimensions you want just by dragging with the mouse. You can select the dimensions you want to work in (select menu over on the right hand side of the screen and choose settings and a screen pops up). Planner5D calculates the area of each room as you go which helps when you're working out budgets. 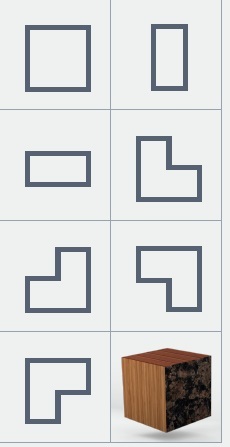 To create more points on the wall, simply right click on the wall, and select the split wall symbol. You can then further split the walls into smaller portions. Dragging the corner points help to create your own custom shapes. That's how I created the bay window. The work space can be zoomed in and out as using the mouse. 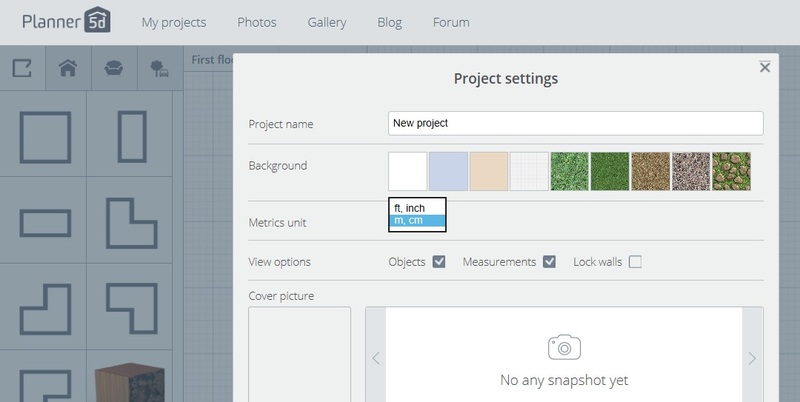 The grid helps you to keep the walls lined up straight and helps with measurements. While dragging and dropping a room, the label of each room by default is ‘living room’. To change that there is a drop down option where you can select other names like : ‘dining room, kitchen, bathroom’. It's a pity there's no option to give a space your own name like 'zen chamber'. 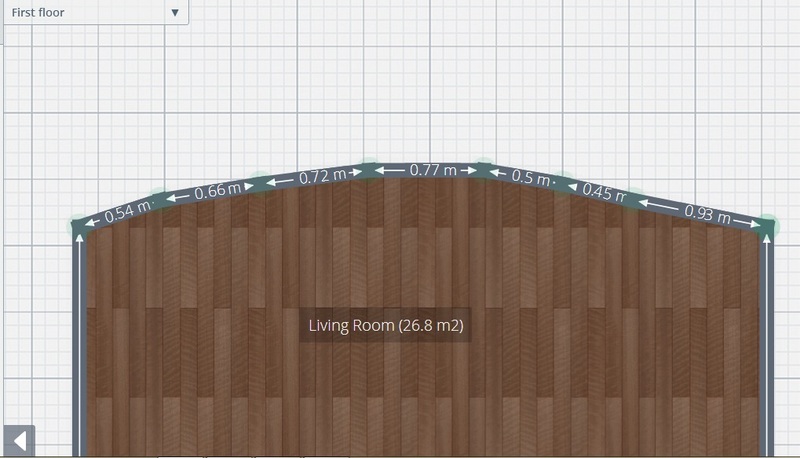 I always look for a way of doing curved walls and the only way in Planner 5D is by putting a lot of straight walls together. The ground floor is easily cloned to make the first floor. When you click the drop down menu of the ground floor, there is an option to add a new floor then you can name the new floor. The it was just a question of moving a few walls, adding a few walls and I had the first floor done. Windows, doors and furniture are added by the usual drag and drop technique. Width and height of doors and windows and furniture can be adjusted. The selection of windows, doors and furniture that's available for free is limited but there's enough there to get going with the layout of your home. If you're hoping to use this tool to create a 'look' you'll probably need to pay to get the pieces you're looking for. One feature that I really like in Planner 5D that I haven't seen in other free floor plan software applications is the fact that you can select pre-made arches onto your plan. Interior details like arches really add richness to a home design. I'd love it if there were other options as well like adding a step level change or a three step level change. How about being able to add a coved or coffered ceiling with just a click and drag. The 3D view loads quickly and the view angle is easy and intuitive to change. There's a camera button on the middle of the screen that allows you to take snapshots of your view. 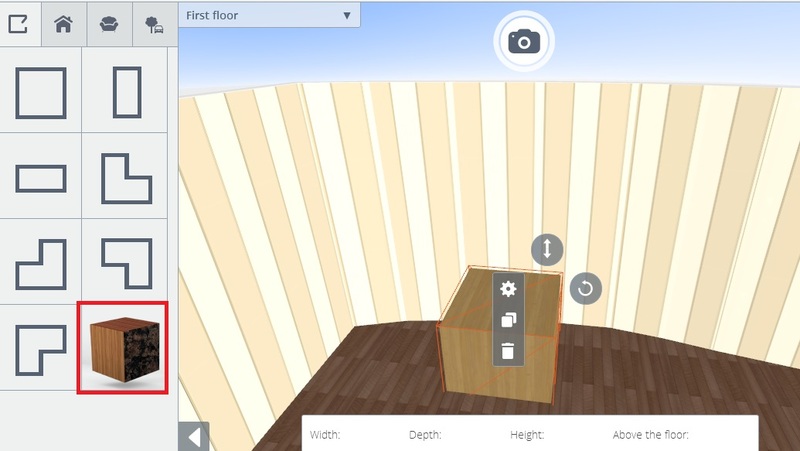 You can add windows, doors and furniture in 3D which makes it easier to see the height adjustments you make. In Planner 5D you can have fun playing around with the exterior as well. You can add a garage, a lawn, pool, and garden furniture. Here's a screen shot of me taking a snapshot of the exterior. Anything you do is automatically saved onto this application. There is also a save project option that saves the project onto your desktop but you need the online application to open it. 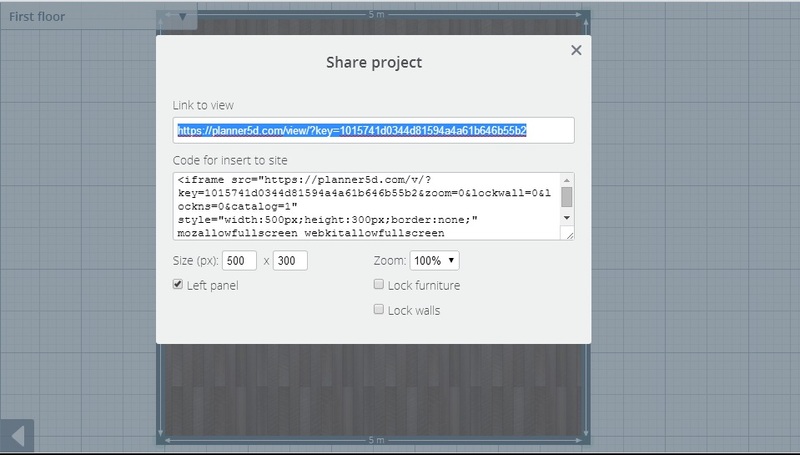 To share, click on the share project menu option on the right hand side of the screen. This provides a link to your project and code if you want to share your project on your blog or website. I've shared the project here. I couldn't find any way to import a drawing to act as a template to trace or to import files of any standard drawing plan format into 5D Planner. Planner 5D only saves in planner 5D format so there's no way of exporting the designs into a format that could be used by other floor plan software. Surprisingly I couldn't find any way to print out a floor plan or shap shot. So the only option is to save something as a snapshot and then print it out. This means that there's no way to print to scale. I guess you could include a 5m x 5m room to the right of your design to provide a sort of scale but there's no way to print to 1:50 or 1:100 or other standard scale. So back to that cube thingy we mentioned at the beginning of this Planner 5D review. I've named it the Magic Cube. Once you've dragged the cube into your plan you can change the material of the cube and create tables, or outcrops on the roof, walls and so on. You can change the material on each side of the box. So let your imagination fly with the magic cube. There are two kinds of help available. One is through forums and the other option is to send in your problem/question or idea and then send it to the help team. Although you'll need to buy access to more symbols if you need to create a particular look. Application runs online. Access to the internet is required to run it. Only for ipad at time of writing. Really easy and intuitive to use. Use settings option under menu. It would be great if this feature could be added. There's no direct print feature but you could save a snap shot and print that. This is an important feature that's missing. Files saved in Planner 5D format only. Good sharing options available - as a link or as code that can be used on a website. What do you think of Planner 5D? I'd love to hear about your experiences using this software.